Evan Sullivan (center) of the LivableStreets Alliance gathered signatures in opposition to plans for Commonwealth Ave.
An aging stretch of Commonwealth Avenue is scheduled for a major overhaul, and many bike and pedestrian advocates hope that the grim numbers of bicycle accidents on the busy street in recent years justify sweeping changes to the layout. At least 68 bicycle crashes occurred between Boston University Bridge and Packard’s Corner in Brighton from 2010 through 2012, including 17 “doorings” and a “right-hook” collision with a truck that killed a bicyclist. But plans for the thoroughfare show additional left-hand turn lanes for cars, narrowed sidewalks, and little improvement to bicycle infrastructure. The reason: federal requirements to widen the swath of land for the Green Line, which cuts through the middle of the street. Officials in the Boston Transportation Department say the plans for Commonwealth Avenue — which have been in the works for at least four years — aren’t set in stone, and they are considering concessions to bicycling advocates and other community members. But they also stress the need to move quickly to capitalize on federal funding that has been earmarked to pay for most of the $16 million project only until fall 2015. Transportation commissioner James Gillooly has asked activists to understand the pressures the city faces, including the threat to funding, limited space on the street, and a need to accommodate the buses that also traverse the thoroughfare. Few thoroughfares touch more nerves than Commonwealth Avenue, the site of some of the city’s earliest bike lanes and one of the most heavily traveled roads in the city. It is where BU graduate student Christopher Weigl was killed by a turning truck in 2012, one of the more high-profile bike collisions in recent years. The first goal for bicyclists is the addition of a protected cycle track — a bikeway separated from vehicles by a barrier, preferably one that is placed between the sidewalk and the row of parking spaces. They say a cycle track would be a significant improvement over the bike lanes already on much of Commonwealth. 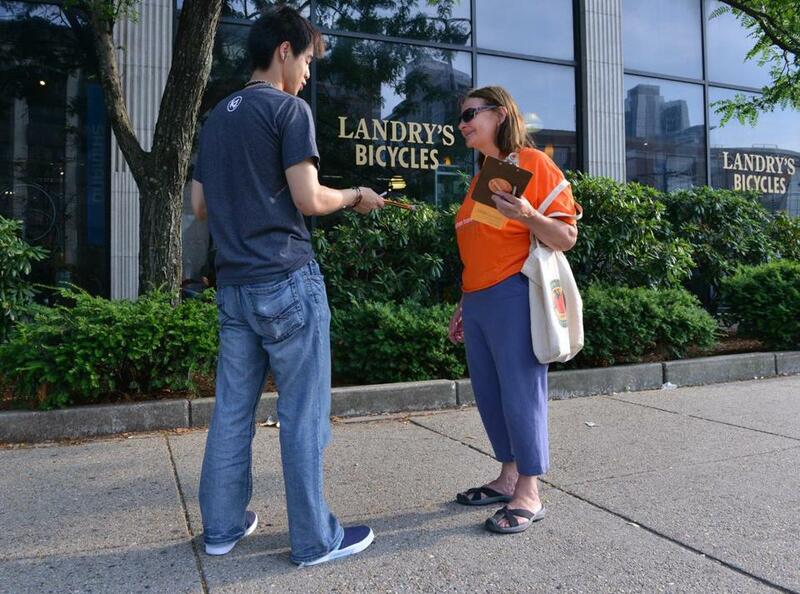 Bike and pedestrian activists have taken to the streets to solicit petition signatures calling for the city to make it easier and safer to bike and walk on Commonwealth. 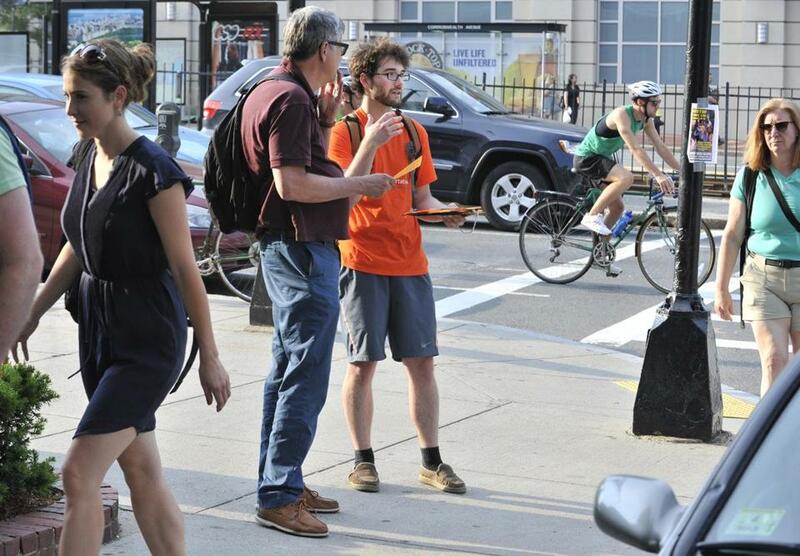 Even as Boston has garnered recognition as one of the country’s most bike-friendly cities, and plans are in the works to add bike lanes and separated bikeways to other parts of the city, the activists view the plans for Commonwealth Avenue as a retrenchment. Starting in 2016, about three-quarters of a mile of Commonwealth Avenue will get a new look, with a repaved surface, new curbs, and refurbished sidewalks. Federal requirements to widen the reservation for the Green Line train tracks are meant to improve safety for MBTA workers who perform maintenance on the tracks. Advocates for pedestrians say they are also concerned about the plan to reduce space on already crowded sidewalks. But many of the advocates’ proposed changes, Gillooly said, are precluded by the fact that the thoroughfare hosts heavy bus traffic — and that lanes need to be wide enough to allow buses to pull over to pick up and let off passengers without blocking multiple lanes of car traffic. Gillooly said he is sympathetic to concerns of cyclists and pedestrians and is thinking of narrowing the car lanes to 10.5 feet in some places, rather than the 11 feet currently in the proposed plan. “We’re talking small increments, but maybe the small increments, if we can cobble together enough of them, might allow us to do something more,” Gillooly said. But in order to receive federal funding, the project must be advertised to contractors by the fall of 2015. Gillooly said there is not enough time to undergo a major alteration to the current design plans. Anything more than modest adjustments would require extensive changes to the engineering of utilities underneath the ground, as well as new layouts for landscaping and a completely different proposal for traffic movement, Gillooly said. It’s too much work to get done by next fall, he continued, when the city is also busy with many other projects. Boston University seems to be siding with the city. In a letter earlier this month to the LivableStreets Alliance, the university’s vice president of government and community affairs, Robert Donahue, stressed the need to avoid eleventh-hour reversals. The last official meeting about the street changes was held two years ago, and those in attendance say few of their suggestions were accommodated. Now, Gillooly said there will be another meeting, probably by September, to keep commuters, residents, and business owners abreast of the plans. But advocates maintain that the city is reneging on promises to use big-budget construction projects to improve the experiences for more sustainable forms of transportation, such as walking and biking. The stretch of Commonwealth Avenue in question was listed in the city’s 30-year bike network plan to receive cycle tracks. Gillooly said some of the cyclists’ safety concerns might be addressed by possible plans to install bike-specific traffic lights along the thoroughfare, which would offer bike riders priority to cross intersections first in some situations. In a statement last fall, Andy Weigl, the father of Christopher Weigl, wrote that Commonwealth Avenue needs improvements. 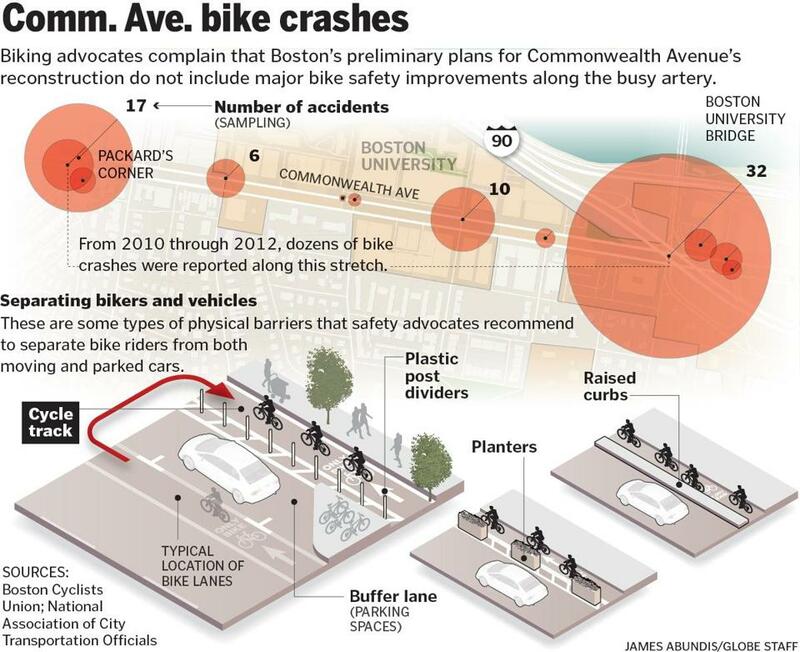 Officials in the Boston Transportation Department say the plans for Commonwealth Avenue — which have been in the works for at least four years — aren’t set in stone, and they are considering concessions to bicycling advocates and other community members.